Welcome to the 2018 BASF Innovations in the Field. This yearlong program is designed to showcase four progressive farmers and their use of technology and agronomic practices to enhance their return on investment and profit potential. Check back each week for new blogs and videos from the farmers as they share their experiences and crop management decisions throughout the growing season. Here is a brief overview of our four participants. Moisture monitoring and fungicide testing is on tap for better yields. You don't need a perfect spring in Central Illinois to have great corn and soybean crops. But JC Henrekin, of Deer Grove, Illinois, did. The result was waist-high corn on June 5. "Spring, however, didn't start off promising," notes Henrekin. "Mid-April it was cold and wet and looked like it was going to be a late season. Then about the third week in April it turned warm and dry, and around April 21 we hit the ground running and had all the corn in the ground by May 1. I don't know that we had ever started planting and not had to stop until we were done. It was crazy!" Henrekin's only early concern was a slight yellowing in corn-on-corn fields. "There was a lot of that yellowish corn in our area," he notes. It wasn't the classic yellow corn, but corn "just didn't have the deep green color like we saw in the corn after soybeans. Those fields looked pretty tough for a week or two," he adds, "and then they came out of it." Henrekin speculates the corn greened up after roots reached the nitrogen and sulfur. "We don't run starter fertilizer," says Henrekin. "Some of our neighbors do, and they didn't seem to have as much early yellow in their corn-on-corn field." Starter fertilizer is something he's planning to look into for next year. Henrekin is already a believer in using fungicides on corn and soybeans. This year, in addition to his regular program, he's running a special trial. Collaborating with Chris Norberg, his area BASF Innovation Specialist, Henrekin is testing if a pre-tassel application of Priaxor® fungicide on V5 corn will generate a yield response this year. "Our Plant Health analytics tool at BASF showed some disease pressure moving north into Illinois in late May," says Norberg, adding that the disease was carried north by Tropical Storm Alberto. "I've already seen a little bit of anthracnose showing up in the area," adds Norberg. Henrekin and Norberg will run the early Priaxor® application in a side-by-side trial to measure yield response. That V5 fungicide application will be in addition to Henrekin's already planned fungicide applications of Priaxor® on soybeans in the R3–R4 stages, and Headline AMP® at tassel on the corn. Because of timely rains, Henrekin hadn't used his pivot irrigation units as of mid-June. Never-the-less, he's taken steps to tighten his irrigation management this year. "I have 12 irrigators and running them is expensive," he notes. "One irrigator uses 250 to 300 gallons of diesel to put on an inch of water." Until this year, Henrekin made his decision on turning on the irrigators by observation. 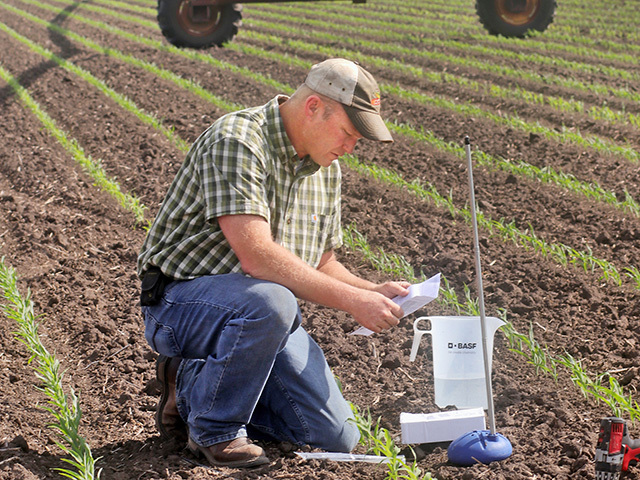 This spring he bought a soil moisture probe to monitor moisture at 8 and 18 inches. The monitor is set up to send readings to his cell phone. "I'm really anxious to better manage our water use," says Henrekin. "All the monitor has to do is save me a half-inch of irrigation water and it's paid for itself."